In theory, sleep takes up about 8 out of every 24 hours, one-third of our lives. 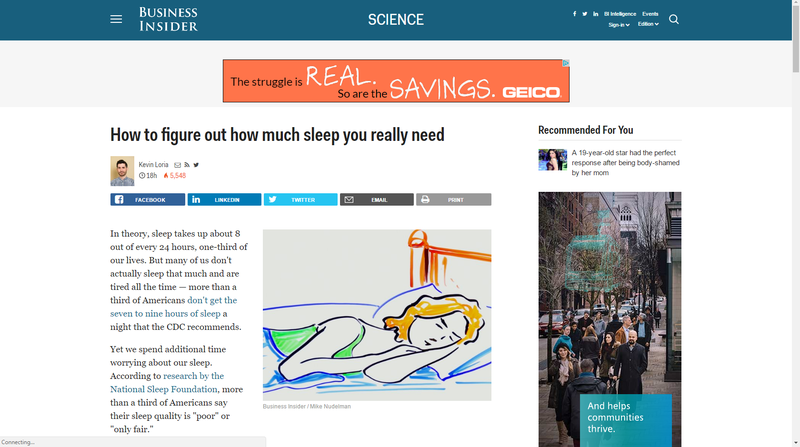 But many of us don’t actually sleep that much and are tired all the time — more than a third of Americans don’t get the seven to nine hours of sleep a night that the CDC recommends. First, let’s get the bad news out of the way: there isn’t going to be a one size fits all answer — sleep needs really do vary from person to person. You could be one of those incredibly rare people that can actually get by on a few hours of rest a night (almost definitely not), or you could be on the opposite end of the spectrum, what doctors refer to as a “long sleeper,” who might need 11 hours a night. But there are some things we do know about getting shut eye, and these can help you figure out how much sleep you actually need — and how to better get a night’s rest. Here are five facts that will help you figure out what your personal sleep patterns are and how they compare to the rest of the population. 1. There’s a reason that doctors usually recommend seven to nine hours of sleep. The amount of sleep that people need falls into a bell curve type distribution, with the vast majority of the population needing between seven and nine hours of rest each night to be refreshed. 2. You have a natural chronotype, or body clock, that determines when you are most comfortable sleeping and being awake. Most of us think of ourselves as morning or night people, but those divisions aren’t scientific — they’re just ways of comparing ourselves to one another. “Where you define owl or lark is really arbitrary,” says Dr. David Welsh, an associate professor studying circadian clocks at UC San Diego. Welsh says that if you look at large surveys of populations, you get a normal distribution of chronotypes — most people have fairly “average” chronotypes, some prefer to get up a bit earlier or later, and small groups naturally rise extremely early or late. There’s no line that distinguishes different chronotypes. But we all do have an internal schedule that makes us feel awake or sleepier at different times of day. Because of factors including hormone levels, genetics, and light exposure, some of us are more alert in the mornings and some of us prefer times later in the day.